About 12 years ago we thought it would be nice to add a couple of rooms on to our house, but unfortunately the builder we employed (fellow by the name of Lukas Neethling, ID 590713 5146 08 3) was a crook, and scarpered with the money without finishing the job, leaving us with a ruin in the back garden. 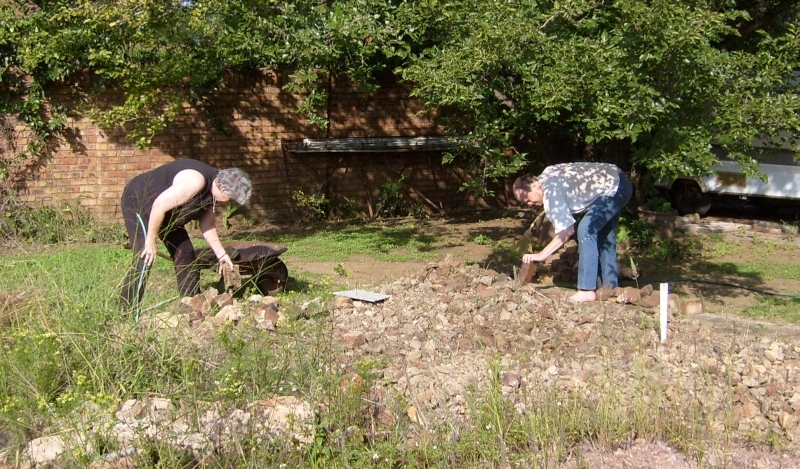 Inspired by my second cousin-in-law, Toni Badcock-Walters, Val decided that now she has retired it might be nice to turn the ruin, or at least part of it, into a raised kitchen garden, so today we made a start on it. Toni explains many of the advantages of a raised garden in her blog, but one of the main ones we envisage is that the dogs are less likely to charge through it on the way to bark at the neighbours’ dogs, or to decide that it would be nice to dig up. 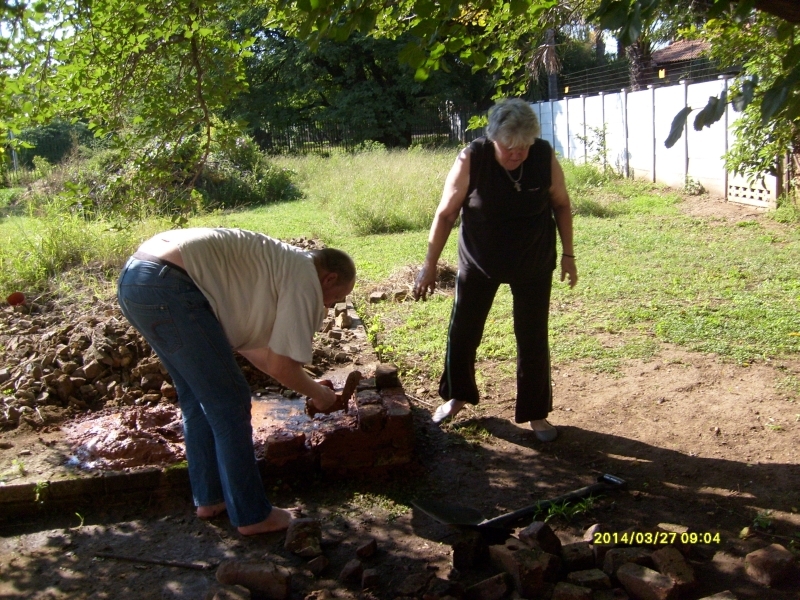 Laying the first bricks for the raised kitchen garden. Not being professional bricklayers, it won’t be a model for bricklaying, but it’s for a garden, not a house. It’ll probably take a while before the first bed is finished, and then we’ll see what we can grow in it. Back to the Dark Ages, or the heat death of the universe? Val retired on 28th February, but the first couple of weeks of her retirement have not gone too well. We have gradually regressed to the 18th century, or to the Dark Ages, On Sunday 2nd March, which was Cheesefare Sunday it rained solidly for most of the day, and it has rained every day since then. At first the rain was welcome, The garden needed it, and the country needed it — fill the dams to last through the winter. But it never stopped. Every day was overcast. Solar power is fine but in these conditions there was enough hot water to wash the dishes, but not enough for everyone to have a bath. 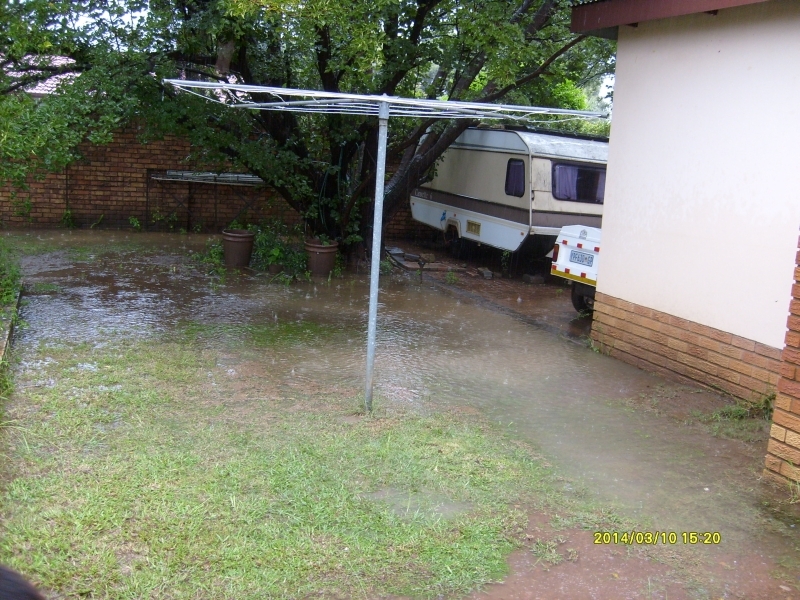 The drains were blocked, and I kept putting off going to clean them until the rain stopped, but it never did. I was reminded of Noah’s advice to the Lord: Make it rain for 40 days and 40 nights, and wait for the sewers to back up. On Tuesday 4th March the phone died, and with it our Internet connection. 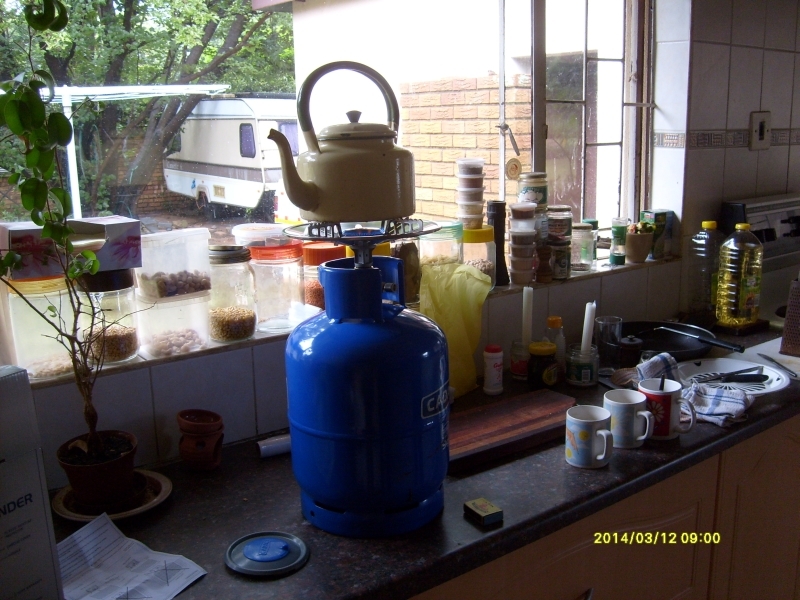 For the previous three weeks it had been giving problems, and we had reported it to Telkom. Sometimes it worked and sometimes it didn’t. But now it was completely dead. As the song goes, you don’t miss your water till your well runs dry. You don’t realise how dependent you become on the Internet. Information you want to look up, which 25 years ago would have entailed a trip to the library, and a search for the books in which one could possibly search for the information has been instantly available on the Internet, through Wikipedia and other resources. Want to check the spelling of a name, or the date of an event, or when is the best time to plant clivias in Gauteng? It’s there at your fingertips. But suddenly it wasn’t. So we regressed to the 20th century, pre-Internet. Through cell phones we still had partial access to services like Twitter and Facebook. It was possible to warn friends not to expect prompt replies to e-mail messages, except that some friends apparently did not see, or did not heed the messages, and began sending messages asking why we did not reply promptly. But typing anything on a minuscule phone keyboard was a pain. People gave links to interesting articles that it wasn’t possible to read, and graphics with trite sentiments urging you to “Like this if you love your sister” became even more annoying. One needs three hands – one to hold the phone, one to type with, and one to hold the magnifying glass so one can read the screen. While the phone service was intermittent, outgoing e-mail piled up. For urgent business it was easier to print out the e-mail, scrawl a reply on it with a pen, and send it by snail mail. Oh, how dependent we are on technology. But we were soon to become more aware of how dependent we are on technology. At about 5 am on Tuesday 11th March the electric power went off. At first we thought that it was Eskom’s load shedding. Because of the rain, the coal for the coal-powered power stations was delivered wet. The slurry blocked the conveyors to the furnaces, and generating capacity dropped. So there were rolling blackouts all around the country to try to reduce the load. These usually lasted a few hours, and the power came back on again. It caused some major problems, such as the Gautrain service being interrupted. But this power outage lasted all day, and into the night. Now we were regressing from the 20th century (pre-Internet) to the 18th (pre-electricity). No electricity means no coffee. Val went out to buy some from a takeaway joint. With the rain, the washing wouldn’t dry, so we had to resort to an electric clothes drier, but now that didn’t work either. After a while, the food in the fridge and freezer begins to go off, so you have to eat it quickly. But there’s nowhere to cook it. Just the thing we need in the first month of Val’s retirement, when we have to learn to live on a fifth of our previous monthly income! We do have a pile of wood in the garden, and we could perhaps have cooked stuff in some cast-iron pots we have, but it’s still raining and the wood is all wet. In the 18th century they could have handled it — they would have had wood-burning stoves, and a place indoors to keep the wood dry. But you can’t make a wood fire in an electric oven. So we ate takeaway food, and listened to the radio by candlelight. One by one, the cell phones died as the batteries went flat. Yesterday we decided that as we couldn’t do anything at home, perhaps we could go and do some research in the archives — provided their electricity wasn’t off too. It wasn’t, so we were also able to recharge our laptop computers and cellphones while we were there, and be in communication with the world for another day, at least enough to say that we couldn’t communicate. When we left the archives at 2:00 pm the sun was shining for the first time in 10 days. When we got home I took advantage of the break to clean the drains, and a huge puddle vanished down the inspection hole. I hoped no municipal inspectors were watching. 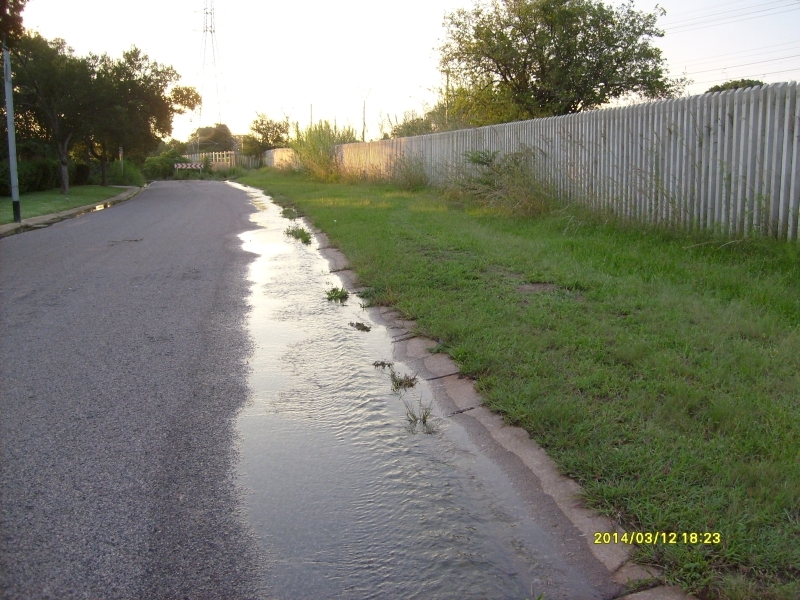 A few years ago one came to our house to ensure that our drains were constructed in such a way that no storm water could enter the sewer system. Cleaning drains is a dirty job, so afterwards I had a bath — my first hot bath for 10 days — the sun had warmed the water. But then the water stopped. There’s plenty of water, running away down the street. If only there were a way of getting it into the pipes! Though we have suffered a few minor inconveniences, others have suffered a lot more. Some have had their homes washed away. People have been drowned trying to cross swollen rivers. But the rain has made us aware of how dependent we are on technology, and how ill-equipped we are to live in conditions that people in the 18th century considered normal, and for many people living in rural areas those conditions are still normal. One of the things we heard while listening to the radio by candlelight was a broadcast on different ways in which people see water — access to water is a human right in our constitution, yet increasingly government and business are seeing it as a commodity. After 1994 Kader Asmal did a great deal to see that rural communities had access to clean water, but that seems to have stalled now. So we have has a small taste of life in the Dark Ages, before the 18th century. Or is it perhaps a taste of the future — climate change, fossil fuels running out, and the heat death of the universe? But for the moment we still have an edge over the Dark Ages — an Internet Cafe, where I’m posting this.